$350 Off Saturday to Saturday. Sandestin + New 6 Seater = GR8 Family Fun! * ENTER DATES & NUMBER OF GUESTS. * CLICK " ASK OWNER A QUESTION" AND REQUEST OUR SATURDAY TO SATURDAY DISCOUNT RATE! DO NOT CLICK "REQUEST TO BOOK" YET. * WE WILL SEND YOU A QUOTE FOR $1549 RENTAL AMOUNT PLUS $150 CLEANING FEE, 11% FLORIDA TAX, $350 REFUNDABLE DAMAGE DEPOSIT AND VRBO SERVICE FEE. YOU SAVE ABOUT $350! AFTER RECEIVING OUR QUOTE, YOU CLICK "ACCEPT" AND GET THE BEST DEAL! *WE SPECIALIZE IN FAMILIES ON VACATION! * PLEASE READ OUR REVIEWS. * REMODELED - FAMILY FRIENDLY. * OWNER OPERATED SINCE 1995. * LOCATED ON THE BEACH SIDE OF HIGHWAY 98. * 2 BEDROOM, 2.5 BATH, SLEEPS 5 IN BEDS PLUS SLEEPER SOFA. * STRICTLY NO SMOKING AND NO PETS. 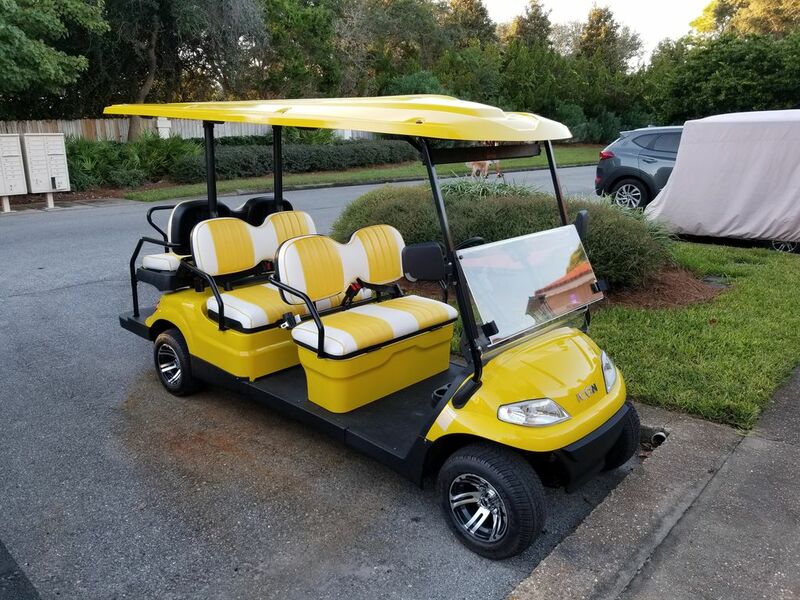 * NEW SIX PASSENGER ELECTRIC GOLF CART PURCHASED OCTOBER, 2018 INCLUDED WITH RENTAL (SEE PHOTO). THE CART MAY BE DRIVEN ON ALL ROADWAYS WITHIN THE RESORT. ENJOY ACCESS TO THE BEACH, BAYTOWNE VILLAGE & MARINA, 4 GOLF COURSES, GRAND SANDESTIN, GRAND BOULEVARD, SHOPPING, GROCERY, RESTAURANTS, ETC. THE ENTIRE RESORT IS ACCESSIBLE VIA CART. SHOULD YOU ENCOUNTER ANY ISSUE WITH THE CART DURING YOUR STAY, ECCO MOTORS, FROM WHOM WE PURCHASED THE CART, SERVES AS OUR AGENT AND WILL HANDLE ALL ISSUES PROFESSIONALLY AND COURTEOUSLY. * ADDITIONAL DETAILS-- Our 1350 square foot professionally decorated town home has 2 bedrooms and 2.5 baths. It is fully furnished in excellent condition. The accommodations are complete for 5. Comfortable living room furniture includes 55 inch VIZIO TV, two leather recliners, sofa and love seat. The Villa has been totally redecorated including ceramic tile floor throughout the entire first level. The kitchen has been updated including stove, refrigerator, dishwasher, microwave oven, cabinets and counter tops. The dining room has a large table and six leather chairs. The bedrooms and laundry facilities (full size washer and dryer) are located on the second floor. The master bedroom includes a king size bed, 32 inch flat screen TV, 2 closets, ceiling fan and full bath with large shower and double vanity. The guest bedroom features one double and one single bed, 32 inch flat screen wall mounted TV, large closet, ceiling fan, computer desk and full bath. * Lakefront villa one-quarter mile from beach (as the crow flies). * Beautiful Beachwalk Pool offers a relaxed setting for owners and guests. Restrooms, furniture and shade available. * Blazing fast Wireless internet (Fiber Optic new Nov. 2018). * Identical villa rents from Sandestin for $2,500 per week (with no golf cart). * Please see our pics. * Rental terms and conditions are shown, below. Most sites do not include the specifics. * BOOK EARLY FOR BEST SELECTION OF AVAILABLE DATES. SPRING BREAK AND SUMMER SELLS OUT EVERY YEAR! * The eastern exposure and full lake view offers a beautiful sunrise over the water and evening shade--the perfect combination for your family vacation. Relax on the deck overlooking the lake. * Do you fish? If so bring your tackle! There are plenty of bass in the lake a few steps away. There are many other lakes on the resort you can also fish in. No fishing license needed anywhere on the resort. The policy is catch and release. Most Villas at Sandestin are on the Bayside of the resort, not the Beachside. Being on the Beachside means you do not have to cross the 6 lane highway. * Sandestin Golf & Beach Resort is the premier resort on the Florida Panhandle. Its 2,400 acres include private beach which you can access from two points. Four eighteen hole championship golf courses are within a mile of the Villa. These are the Links, Baytowne, Raven and Burnt Pine. Many fine restaurants and nightclubs are found at Baytowne Village. Likewise, Grand Boulevard offers a variety of restaurants including Flemings, PF Changs, Tommy Bahama, Emeril's and many others. An upscale theater is now open. * You will also find tennis, marina, health club, salon, and other activities. Travel Insurance available from VRBO. DEEP SEA FISHING. Destin has the best deep sea fishing anywhere on the Florida Gulf coast. A large fleet of charter boats is located in the Destin Harbor eighthrough VRBO.t miles west. PLEASE NOTE THE FOLLOWING TERMS AND CONDITIONS OF THIS RENTAL. You agree to these by payment of the rental amount. (1) The property address is 5194 Beachwalk Drive, Miramar Beach, FL 32550. (2) Cancellation Policy--In case of mandatory evacuation, pro rata refund of unused nights. (3) Weekly rentals receiving the advertised discount rate are Saturday to Saturday. All quoted rates are in U.S. Dollars. (4) Check-in time is 4:00 p.m. local time (central time zone). Check-out time is 11:00 a.m. All damage, if any, must be noted at check in. No exceptions. Failure to depart on time may delay cleaning services resulting in additional charges. (5) No Pets or Smoking allowed on the premises. Additional charges of not less than $400 will apply to remedy. If you must smoke, light up outdoors and properly dispose of cigarette/cigar butts. (6) To rent this Villa you must be 25 years of age or older. No rentals will be made to vacationing students or singles under the age of 25. Anyone under the age of 25 must be accompanied by their parents at all times when in the Villa. By renting the Villa you certify that you meet these age requirements. (7) The person(s) renting the Villa shall occupy the Villa. No subletting is permitted. (8) $350 refundable Key/Damage Deposit required. If you or your guests cause damage during your stay (to the Villa or Golf Cart), you will be charged based upon replacement cost of the item(s) damaged plus cleaning fee if any. Guest's failure to return the keys to Owner within 14 days of departure date will result in $200 re-key charge. Any damage will be first paid from the deposit. Should damages exceed the amount of deposit, the overage shall be Guest's financial responsibility. Guest(s) authorize Owner to charge said overage to the credit cart that was used to process this reservation. (9) Breach of items (5), (6) or (7) will result in immediate eviction with no return of any and all funds paid. (10) Owner's Closet. The villa has two (2) locked private Owner's Closets that are not part of the Guest(s) rental and Guest(s) agree(s) not to disturb same. (11) Acts of God. Owners are not responsible for acts of God consisting of but not limited to fire, flood, strikes, war, road maintenance and inclement weather. (12) Repairs and Service Calls. Owners cannot guarantee against mechanical failures and Guest(s) agree to immediately notify Owners of defective or non working units. Every effort to repair or replace defective units quickly and efficiently will be made. No refunds will be given for failure of mechanical units. Service calls resulting from neglect or misuse of Guest(s) shall be Guest's financial responsibility. (13) Right of Entry. Owners reserve the right to enter the property to investigate disturbances, check occupancy, check damages, and make repairs as Owners deem necessary. Owner will attempt to notify Guest(s) should service/repair entry be necessary. (14) You and your guests will strictly abide by all Federal, State, Local and Sandestin laws, rules and regulations. (15) You shall indemnify and hold Owner harmless from action(s)of yourself or others present along with you during the rental period. We love being with our family and friends at Sandestin! Everything about the area is family fun oriented. We want to share our villa with others wishing to experience the same things we enjoy. There is so much to do here--golf, beach, fishing, shopping, dining, entertainment...you name it! Do you enjoy watching the FULL MOON rise? If you do, there is nothing like seeing it come up over the lake from the deck. Full moon dates for 2019 are January 21; February 19; March 21; April 19; May 18; June 17; July 16; August 15; September 14; October 13; November 12; and December 12.. Highly recommended! Catch and release fishing. Bring you own rod and reel. No swimming, wading, kayaking, etc. Located on beautiful Horseshoe Lake just behind the Gulf of Mexico. New Blazing fast fiber optic internet as of November, 2018. New blazing fast WIFI as of November, 2018. Keurig. Bring you own coffee. Up to date kitchen includes stainless steel double sink, electric stove, refrigerator, microwave oven, blender, toaster, coffee grinder etc. Large table and 6 chairs. See photo. 55" Vizio with sound bar in living room. Beachwalk Pool for owners and guests. Large pool deck; furniture including chairs, tables, lounges; Nice restrooms. Shaded area available. See photos. WE SPECIALIZE IN FAMILIES ON VACATION. Fully Equipped Kitchen, full size washer and dryer, comfortable furniture, 55 inch Vizio with sound bar in living room and 32 inch flat screen TVs in bedrooms. Well equipped comfortable villa. Sleeps 5. We really enjoyed our stay here and will be returning again! The owners were very warm and helpful! Thank you Katie, great to hear your family will be returning again. What a fun and relaxing summer vacation!!! We stayed at the Beachwalk villa May 26-6/4 which Tom and Connie were so easy to work with! The beach villa was very cozy and beautiful coastal decor, kitchen stocked with lots cooking utensils but will need to purchase your own spice, dish detergent, paper towels, toilet papers, the washer and dryer were very convenient as we washed many loads of clothes after the beach, there were 4 beach towels, 3 beach chairs, 2 beach umbrellas (a bit worn though) and some beach toys for use which was nice, the master bedroom was very spacious with king size bed and the 2nd bedroom has a full and a twin bed which was nice for the kids. We were able to use the golf cart to travel to the Sandestin beach with beautiful white fine sand and turquoise water, explored around Sandestin resort, hiking, saw the 'Avengers Infintiy War at the Bouvevard 10 Theatre during tropical storm, Baytown Wharf, fishing at the pier and Publix to get grocery. Although we did have some problems with the bathrooms outlet not working and golf cart out of service for 1.5 half, Tom was very responsive in arranging someone to repair for us right away. Sandestin is also not far from Fort Walton which we got to explore and visited the US Air Force Museum (free admission and very educational), Harbour Walk with many shops and restaurants, beautiful Walton Beach and awesome meal at the Shrimps Basket! We got to try nearby restaurants: Pompano Joe, Roberto Pizzaria, Bric A Brac, Whatabuger, Robinson's Cruse Thru, Shrimps Basket and got fresh seafood from Shrimps Seafood Market. The kids also had an amazing time at the Seascape sky trials! What a fun vacation for all of us and we can't wait to come back again soon! We regret the electrical problems Jason and his family experienced. The tropical storm shorted out the golf cart battery charger. The ground fault circuit the charger utilizes is shared with the wall outlets in the bathrooms of the Villa. As Jason said, we worked to resolve the problem as quickly as possible. The new battery charger totally resolved the electrical issues and Jason was reimbursed for loss of use of the cart as called for in the rental agreement. Jason was easy to work with. We hope his family returns again as they are certainly welcome. Relaxing family time! Great location- very clean and comfortable villa. Tom and Connie are outstanding hosts! Our family’s 5 th year at their villa in Sandestin. The villa is very clean and spacious and the included golf cart makes traveling to beach, dinner, and shopping easy and fun! The condo was comfortable, it had all the necessary amenities and a relaxing view of the pond. The golf cart certainly made traveling the property much easier. I enjoyed not being in a high rise, not dealing with the crowded/slow elevators! The water was beautiful! When we wanted to go to the beach, we packed the family and beach stuff on the golf cart then we went on our way. Plus, several nights we used the golf cart to go out to dinner! Definitely a location we want to return to! Everything we hoped it would be and more! I can't say enough great things about our stay at Connie and Tom's Beachwalk villa! The villa was immaculate and very well laid out with all of the essentials for a relaxing week with teens and adults. There were several Beach chairs, boogie boards and sand toys too! The location is great, close to the beach and pool. We brought our grill and cooked several meals in the well appointed kitchen and enjoyed dining inside and out on the deck to enjoy the view of the lake. The bedrooms are spacious and The beds were really comfy too! Our teens enjoyed the TV set up in their room and their private bath. We loved having the golf cart to tool around it and took it to the Marina and the beach daily. There's plenty to do on the property, something for everyone! Connie called our first night to make sure we had everything we needed, That was lovely. This is not just a rental property, its a home and The Ewens care for it as such. Their communication prior to and upon our arrival was excellent. Great Villa, great hosts and a wonderful week of memories and we would love to stay here again soon! Thanks Connie and Tom! Again, we had a wonderful time at the beach. This is our second time at this condo. Tom and Connie is awesome to rent from. Connie called the day of our arrival to make sure everything was ok. We arrived a little early and met the cleaning people. They were very friendly and accommodating. The condo was spotless. We enjoyed the golf cart. We did have a flat tire during the week and called the service and Connie. It was fixed in a reasonable amount of time with no difficulty. I would definitely recommend this condo to anyone except if it happened to be the week that we come back. Tom and Connie I will let you know as soon as I get the dates for next year. Thank again for another great week. The Emerald Coast is best known for its white sand beaches. The shopping, dining, fishing, golfing, relaxing... just enjoying your family and friends is easy to do here. IN CASE OF MANDATORY EVACUATION, PRO RATA REFUND OF UNUSED NIGHTS. FULL CONFIRMATION WITH FULL PAYMENT.